Heavy duty gantry crane is an efficient material handling solution widely applied in manufacturing industry, construction site, ship building industry, shipyard, port, rail terminals and so on to perform large and heavy lifting tasks. The lifting capacity of this heavy duty crane ranges from dozens of tons to several hundreds tons to suit various application requirements. A typical design of heavy duty gantry crane falls in double girder so as to undertake heavy loads. 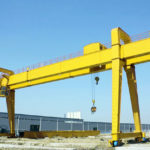 The heavy duty gantry cranes manufactured by Ellsen have many different types. 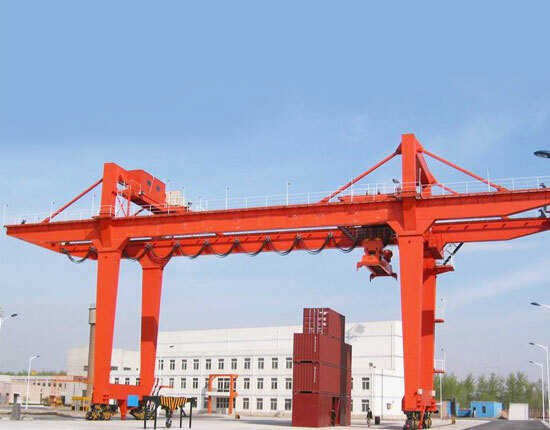 According to different running mechanisms, we supply rail mounted gantry crane, rubber tyred gantry crane and other types of portable gantry cranes. 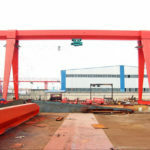 With regard to different gantry frames designs, we have A frame gantry crane and U frame gantry crane for your choice. We also provide custom design on your request. Our heavy duty gantry crane is available in several main models to cover a wide range of lifting needs. 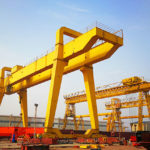 Before selecting a heavy duty crane for your application, you should have a basic understanding of these different types of heavy duty gantry cranes. MG double girder gantry crane is one of the most commonly used lifting systems for many indoor and open workplaces. It is a typical A-frame gantry crane, mainly composed of main beam, supporting legs, end carriages, hoist trolley, optional saddle, and electrical system. Its capacity can reach 200 ton. This lifting equipment has advantages of high utilization of working site, strong versatility and adaptability. The main beam is mounted on A-shape gantry frame which is connected to end carriages. 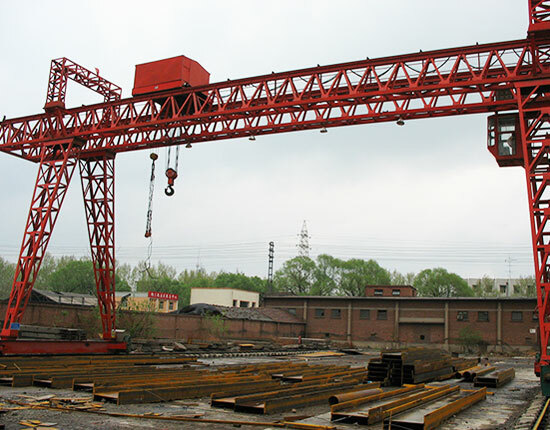 Its design is based on the crane working duty and operation frequency. This MG gantry crane is a rail mounted type as the end carriages travel on rails mounted on the ground. The saddle structure makes the equipment bear a more reasonable force. According to differential environmental conditions, you can choose the most suitable metal structure including box and truss type. 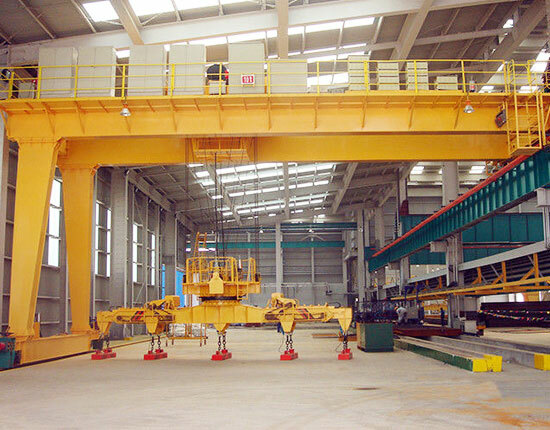 In addition, you can determine your heavy duty gantry crane with or without cantilever. U type gantry crane is another type of heavy duty gantry crane, suitable to handle large sized materials such as containers. 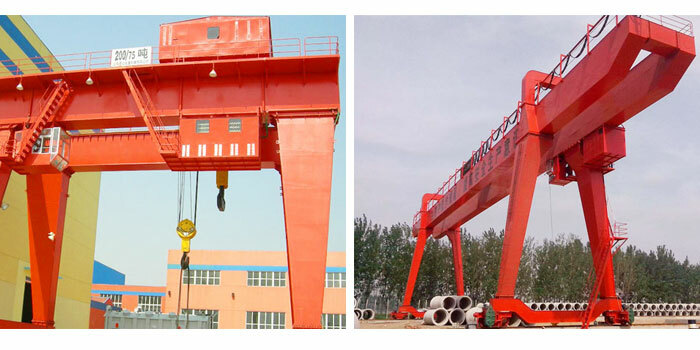 Due to the U shape design, there is larger space between two legs in contrast to A type gantry crane. 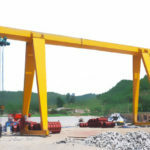 Besides, this gantry lifting equipment does not require any saddle support, therefore the overall height of this gantry crane can be lowered given the same lifting height. 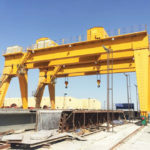 Rubber tyred gantry crane is a more flexible and convenient lifting solution, which is very popular in port, quayside, and railway to handle large and bulky loads. 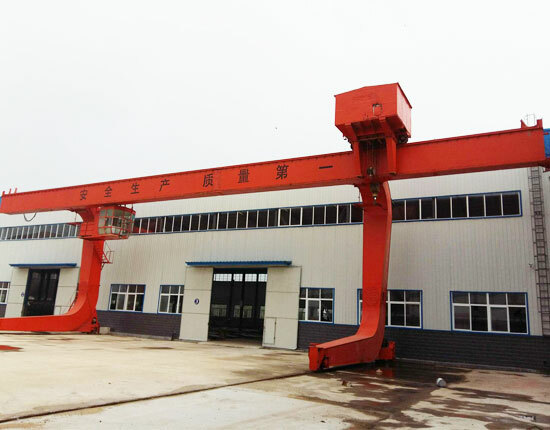 Without fixed rails, this portable gantry crane can reach the whole working area freely. It has many advantages, such as strong mobility, good heat dissipation of tires, durable performance and minimal maintenance. Due to the mobile design, this heavy duty mobile gantry crane is usually powered by diesel generator sets. Other protection devices can be outfitted on your request to ensure a highly safe operation, including anti-collision device and anti-swaying device. 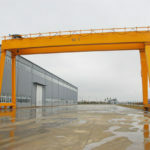 Which type of heavy duty gantry crane is suitable for your need is determined by your application requirements. So you should consider a few things such as if you need a more flexible lifting system or not, or what your gantry crane is used for. For different applications, we will provide the most appropriate material handling solution so as to maximize your production. 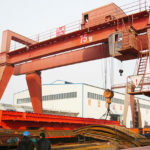 The heavy duty gantry cranes whether designed in A frame, U frame or mobile type, are normally operated by wireless remote control, cab operation or the combination of the two methods. The specific operating mode is highly dependent on the gantry crane type you choose and its working condition. The cab operating mode allows operators to sit in the cab to complete their work. Many heavy duty gantry cranes especially container gantry crane will adopt this operation method. Since the cab is mounted on the gantry crane, the view of operations will be subject to a certain restriction, which is prone to accidents. Therefore, an additional worker from the ground is more often needed to work together with cab operator in order to complete the lifting tasks perfectly. Besides, the cab operator should receive professional training and have qualification to do the job. The wireless remote control is a popular option for both light duty and heavy duty gantry crane as it only requires the crane operator to complete the operation from the ground. Through remote control, the operator can choose a better and more secure position to operate the equipment without operator’s view being blocked. It features low cost, durable performance and minimal maintenance. In addition, without the need of an additional co-worker during gantry crane operation, the remote control can greatly improve the working efficiency. 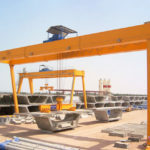 For different applications, you can adopt various types of gantry cranes to carry out lifting tasks, and the price of each gantry crane differs from each other. The key to buy a heavy duty gantry crane is to choose a cost-efficient one so as to create maximum value for your business. 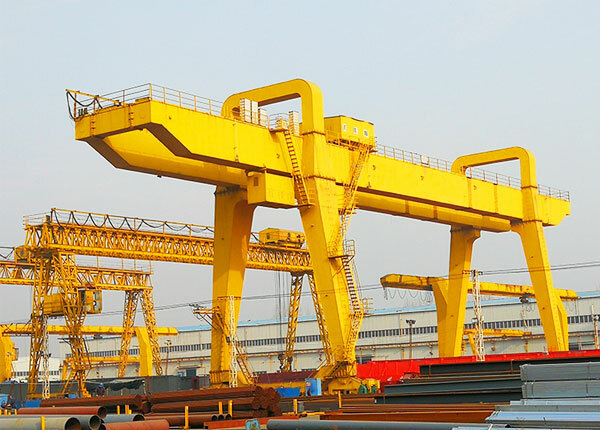 We are leading gantry crane manufacturer in China and have specialized in designing and fabricating material handling equipment for many years, including overhead crane, gantry crane, jib crane, electric hoist, construction winch and marine winch. Our products have been exported to over 80 countries and regions such as Pakistan, Thailand, Russia, Saudi Arabia, and South Africa with a stable growth in sales year after year. By means of introducing advanced processing equipment, establishing lean management model and strict quality control system, We always supply quality products to our clients. Our gantry cranes have pass ISO and CE certification, and are all manufactured in accordance with industrial and international standards. We also supply technical support and other after-sales services including installation and maintenance to customers. If you have any technical problem, please feel free to contract us. We are quite willing to solve your problem and build the best lifting solution for your application. 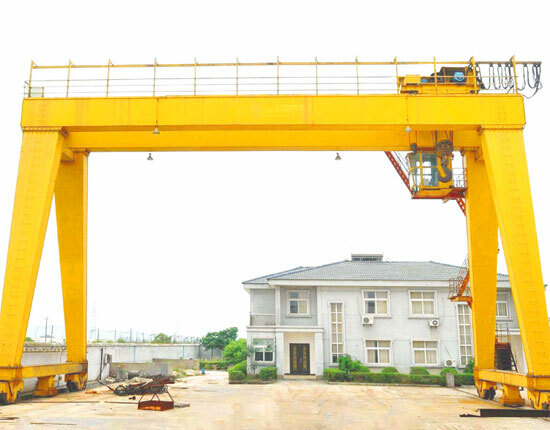 If you are interested in our heavy duty gantry crane, contact us now. We will offer the best price to you!